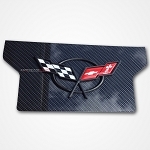 Exhaust enhancer plates are made for most corvette models. These plates are meant to dress up the back-end of your vehicle by filling in the space between the exhaust pipes. 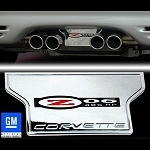 The exhaust enhancer plates that are most common were developed to fit all Corvette models between 1997 and 2004. The plate models made for those production years are short, with a squared off design through the bottom of the plate. Racing flags are a popular graphic element to these plates, with some plates available in plain stainless steel and graphic free. 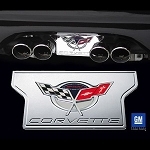 For later models, the exhaust enhancer plates made for Corvette models in 2005 through 2013 are different in design. 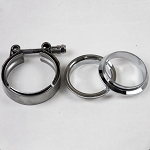 A thinner middle between exhaust pipes and a longer, almost tear drop design to the bottom of the plate is the main style change from previous plates. It is important to note that not all exhaust enhancer plates attach to the backend in the same way. Some plates can be attached using double sided tape, some plates need to be bolted straight onto the back end, while other plates can be bolted using the car’s factory installed plate hooks with bolts already attached to the vehicle. 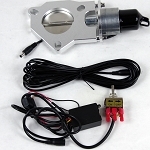 The method of attachment all depends on whether the car comes with a factory exhaust or a NPP exhaust system and what type of plate that you want to use that will enhance the overall look of your corvette. With all C5 Corvettes however, the method is simple double sided tape in most applications!